On the occasion of the 10th anniversary of the Cyprus Branch, we were delighted to welcome the President of the Nautical Institute, Captain Robbie Middleton to the island. The objective of the visit was for Captain Middleton to see how the local branch operated, meet Cyprus flag officials, view the local ship management infrastructure and meet the Royal Naval Liaison team on the Sovereign Base Area (SBA) as well as join in the 10th Anniversary celebration. His itinerary began with a visit to the Cyprus Flag Authority and a meeting with Mr Serghios Serghiou, Director of the Cyprus Department of Merchant Shipping accompanied by Branch Chairman, Graham Cowling. The Department is responsible for the operation of the Cyprus Flag. Discussions focused on how the Nautical Institute could help the department through accreditation and training courses for Cyprus Flag surveyors, the function of the Nautical Campus and the comprehensive selection of Institute publications. Next on the agenda was a visit to Interorient Navigation where Captain Middleton was given a tour by Captain Peter Bond, FNI, Safety and Quality Manager. This gave Captain Middleton an insight into how ship managers and owners are working on the Island. The Cyprus Shipping Council (CSC) is the owner’s and managers representative body on the island and the branch has strong links and good co-operation with this organisation. It was therefore appropriate that Captain Middleton could meet CSC Marine Manager, Mr Alex Josephides. Further visits to Columbia Ship Management and Unicom Ship Management were organised during the President’s stay accompanied by Mark Bull MNI (Honorary Secretary of the Branch) and John West, FNI, Ex-Chairman and a current committee member respectively. 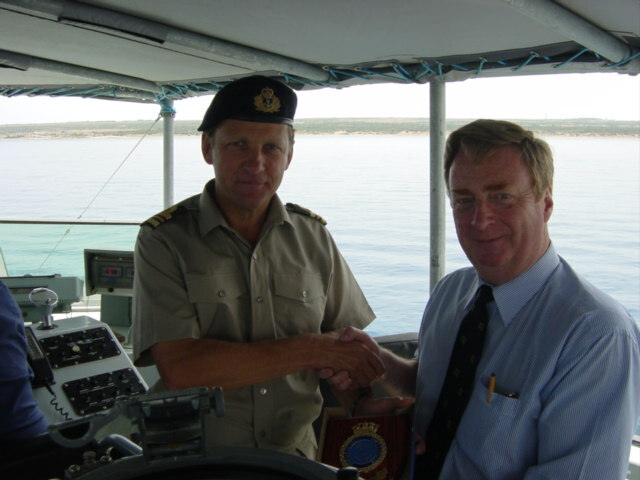 The 10th anniversary celebrations of the Cyprus Branch together with the AGM were held on 10th May 2003 at the Hanseatic Marine Training School (HMTS). During the AGM, the President addressed the Branch on the subject ‘The Future of the Institute’ and described the various projects now underway using a very effective powerpoint display. One issue was how the branches can contribute further to the success of the Institute by holding seminars and workshops as well as taking non specific project work. Captain Middleton also developed a case study on how branches might develop themselves through expanding membership, recruitment, seminars and project work. It was a warm spring evening and, after the formalities, the celebrations for the 10th anniversary were held on the parade ground at the School. The school did a tremendous job in decking out the masts and derricks with flags with the NI flag having pride of place on the main board. Members and their guests enjoyed pre-dinner drinks at a bar service provided from a mock-up hatch cover (very appropriate) and enjoyed views across the Marina to the Old Port as dusk settled. Before the buffet, Captain Middleton, Graham Cowling, ex-Branch Chairman and Captain Fraser Betts, Principal of HMTS, gave short welcoming speeches and congratulated the branch on the first 10 years, hoping there will be many more! white and black uniforms. Thoughts turned from food to dancing and everyone thoroughly enjoyed the evening dancing and swapping stories about what it was like when they were at sea! After a day to recover from the party, the next item on the timetable was a visit to the Royal Navy liaison team on the SBA at Akrotiri together with Graham Cowling and Captain Betts. Security was tight and we all had to show gate passes on arrival. We were met by Lieutenant Commander ‘Nobby’ Hall, who is the Senior Naval Liaison Officer on the island. Lunch at the Officer’s mess gave us an opportunity to meet the Commander of the Protection squadron and his team before we made our way to the harbour and got aboard the Protection Squadron vessels. These are 40ft boats that are armed and can achieve a speed of about 20 knots. They have a crew of six. 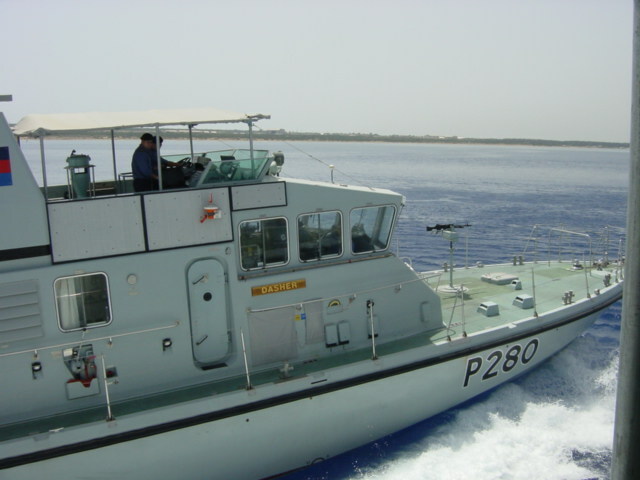 Working closely with Royal Marine teams in small inflatable boats, these craft monitor ship and boat activity off the Akrotiri peninsular. They are based in Akrotiri to prevent terrorist attacks and to make sure that tankers unloading jet fuel on the buoys are safe. The Squadron was put through its paces as we watched a series of exercises including close quarter manoeuvring, crossing exercises with the inflatables and a fly-past by a RAF helicopter. NI can progress forward and we look forward to the next opportunity when he will return to Cyprus.